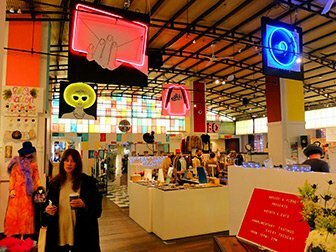 Shopping in SoHo should definitely be part of your New York trip. 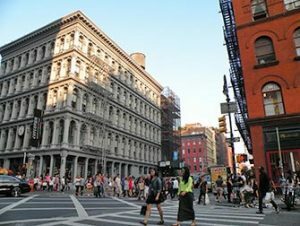 SoHo is the area between Houston Street, Canal Street, Sixth Avenue and Lafayette Street which also gives it its name: South of Houston. Every street corner is bursting with shops, a mix of high street and boutique. In addition, your experience is enhanced by the beautiful buildings and cobblestone streets. It’s easy to get a bit lost in SoHo, but don’t worry. You’ll probably just discover a new fantastic store! It can get very busy at weekends, especially in the afternoon. So, if you can, plan your shopping on a weekday. If you’re not sure where to start, take the subway to Prince Street or, if on foot, head to the crossing of Prince Street and Broadway. Pretty much most of the major brands are found along Broadway. 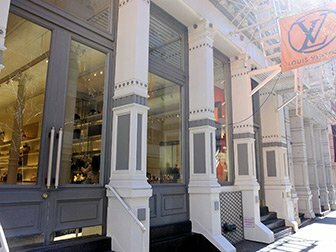 If you are looking for more boutique stores, then head to Prince, Broome and Spring Streets. Also, for art lovers, West Broadway has the most galleries. There is a Bloomingdale’s on Broadway. It’s a bit smaller than the Midtown location. It also has free wifi and free toilets (look for signs that say lounge/restroom) so it’s a good pitstop during your shopping spree too. You’ll also find Old Navy where you can find cheap clothing, also for children. 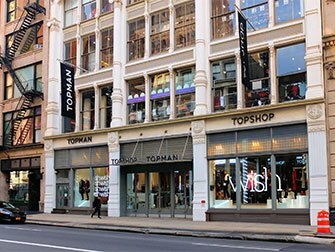 You’ll also find stores like Banana Republic, American Eagle Outfitters, H&M, Uniqlo and Topshop on Broadway. Also Forever 21 and Victoria’s Secret are here. But it’s not only clothing. Head to Best Buy for electronics or to Crate and Barrel for interior goods. Artists & Fleas is an indoor market with a few locations in New York, including one in SoHo, on Broadway. 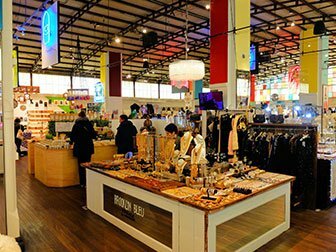 This branch has a collection of over 40 stalls offering a wide variety of unique, mostly handmade products. You can find art, jewellery, clothing and design pieces. Artists & Fleas SoHo is housed in an old sewing factory, giving it an industrial feel. Unlike the other locations, the market in SoHo is open daily. So, you can always head here for unique gifts or just to take a look around. Take off from Broadway and wander the cobblestone streets away from the biggest crowds. You’ll find luxury brands like Louis Vuitton and Stella McCartney. On Prince Street there is a big Apple store. West Broadway is also worth a stroll. It has a few nice art galleries and you can find French Connection and Reiss there. Greene Street is also nice and usually a bit quieter.